Richard Pitino wasn’t shy about addressing the negativity he experienced last season and into the summer after the Gophers' tumultuous 2015-2016 season. The team finished 8-23 overall and won just two games in the Big Ten. Off the court, the results were just as grim with several scandals involving Pitino’s players. The messy combination was supposed to get Pitino fired or at least that’s what many of the fans wanted. A year later, Pitino is the Big Ten Coach of the Year. Gophers sophomore and Third Team All-Big Ten forward Jordan Murphy said Pitino never showed signs that the negativity was getting to him. Murphy also didn’t realize the level of scrutiny Pitino was under. “Definitely proud of him,” Murphy said. “What he’s been through the past year and having so much pressure put on him and doing such a good job and just coaching through it, and not worrying about the outside noise. As a team, we’re really proud of him. A year removed from this stream of criticism, here is a look back on some of the mean tweets and the new mean tweets directed back at those who scorned Pitino. Why haven't we fired Pitino yet? Honestly, if @GopherMBB wasn't absolute trash, and if Richard's last name was anything but Pitino, he'd have been fired a while ago. Should Richard Pitino be fired? How does Richard Pitino not get fired at Minnesota after getting blown out vs. 6-21 Rutgers today? I'm gonna laugh when Richard and Rick Pitino get fired this off season. Odds that Richard moved back in with his parents? Classic Sid column today. 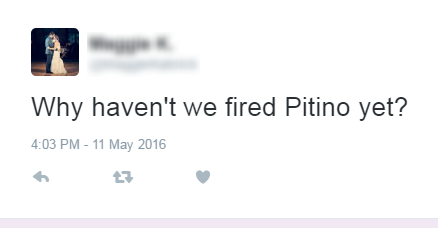 Other sportswriters, fans wanted R.Pitino fired last year. "Genius" East Coast reporters wrong on Rubio-to-Knicks. @KFAN1003 @Chris_Hawkey Lucky he had a big buyout, otherwise he would've been fired last year. Pitino doubters should be happy. @DWolfsonKSTP when is pitino getting fired? lol. I'm guessing you don't miss being asked that anymore. Poll: How many games will the Gophers win in the Big Ten basketball tournament?